She cheers for the Edmonton Oilers! Thank you for posting her picture. She loves her little pink jersey and hopes to play one day like Daddy did. I have sent this link to all our family to brag on her. PS – love the website. Great job and very informative. I will share this with some of my southern girlfriends who often seem lost when I take them to a game. Maybe this will allow me to spend more time watching the game and less time explaining the game. Thank you. I’m still working on getting all the content up. Bigger project that I though it would be. haha. Your daughter is adorable! the cutest little edmonton oiler fan everrr !!!! Cutest picture EVER!! Definitely deserves fan of the week!! Brooke – you are too cool, just like your mom. The NC Hurricanes fans are going to miss you but you will be a great addition to the Oilers fan roster. Peace (and puckered lips) out. Cheer On! 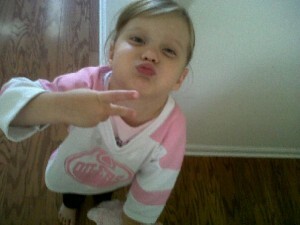 My sweet little Canadian Bacon… Cutest Edmonton Oilers fan ever!